That initial meeting must have been delicious for any gear junkies in the group. No one had super-expensive cameras, but a lot of people had machines with stories attached to them. Sara from Galicia carried a Werlisa, and it had been no more than an ornament in a relative’s house. They were surprised when she asked, “Can I use that?” They asked her why she wanted it, and she said “To take photos, of course!” Sara gave the camera a second, or perhaps third life. Erwann’s Foca was one of the oldest cameras of the bunch. It’s a little silvery machine, with very finely etched meters and finely worked controls. With its name I had assumed it was Italian, but it is a French camera, or at least was made in France. My Yashica FX3 (1986) I bought at the momentarily defunct Mercado de Motores for twenty-five Euros. I saw the original Fotocasion sales ticket, where the guy who sold it to me had paid two hundred Euros for it two years before. Works well and accepts Carl Zeiss lenses from the 1980s, which at the time were among the finest a photographer could buy. They still fetch a fair market price, almost thirty years later. Some people borrowed cameras from the parents, and some borrowed cameras from their grandparents. Some cameras were found to contain batteries that hadn’t been changed for again, almost thirty years. Before the meetup there were laughs to be had as people struggled as one to load film and to learn to calibrate their machines. Luckily, more than a few were around to volunteer to lend a hand, be it by donating batteries or showing a newbie how to adjust shutter speed and aperture on their particular camera. The veterans showed great spirit and patience in their aid-giving. The time to prepare having past, the group “exploded” in all different directions (as is customary in Crisol) to see what it could frame that day. The hours passed quickly and I don’t know that anyone got through a roll of film that day. We reconvened in the afternoon to share a lunch, at which point some members, myself included, left for home. There were many who continued on, however, and by all accounts the Film Camera Photowalk was a success. We’ll have to wait and see whether the darkroom chemicals confirm or refute that opinion! 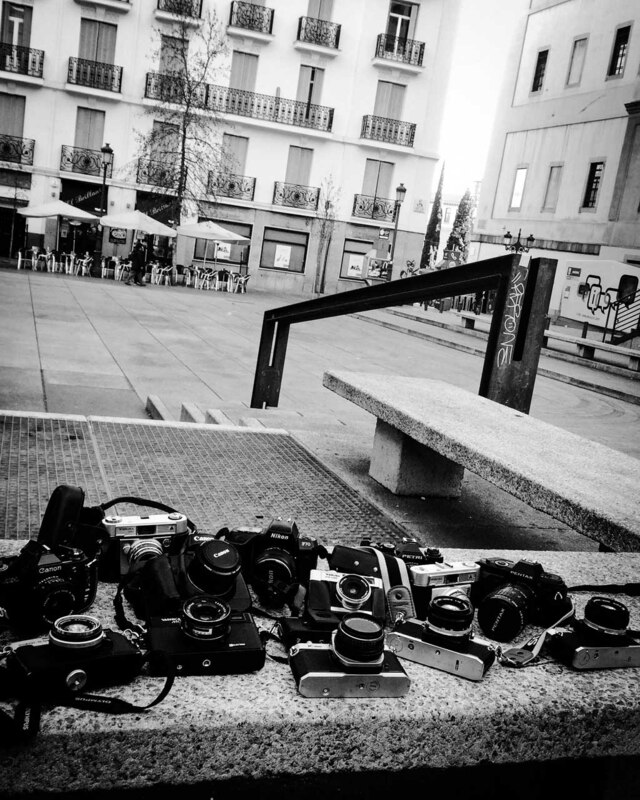 This entry was posted in Photo Walks and tagged camera, film, madrid, neveu, photowalk, sophy. I really enjoyed the time we walked shooting with such a pretty old cameras and It was lovely to meet you too…I hope well do it again in the future. Thank you for participating, Carlos! It was nice to meet you, too! Hope to see you again soon!